100% Polyester Interlock. Two button placket jersey with set-in sleeves. Self-material piping in the insert. 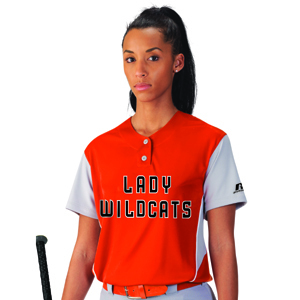 HS Cloth in side and upper shoulder insert for more breathability. Curved hemmed bottom. Pad print label at inside center back neck. Neck taping with Russell Athletic branded. "R RUSSELL" left sleeve. Shown with optional decoration not included.